Written by Stuart Murry, March 1, 1979. Between the hours of 8 a.m. and 4.p.m. five days a week, Sgt. John Garvey Sr. of the Columbia County Sheriff's Department, is on duty and responsible for communication with 46 fire companies, 10 police departments and most of the county's seven rescue squads. Sgt. Garvey is in charge of communications with the professional and volunteer agencies responsible for the security and well being of the more than 50,000 residents of Columbia County. Headquartered in bright new facilities at the refurbished Charles S. Williams School in Hudson, the sheriff's department communications system is run by nine regulars, including Sgt. Garvey, and several part-timers. The communications room whirrs with the sound of modern computers and crackles with radio calls coming in over the department's scanner. Busy in the center of the efficient, contempary center, Sgt. Garvey calmly, effectively, keeps communications amongst the hundreds of people who rely on the electronic controlled center flowing. Sgt. Garvey's quiet, thoughtful manner conceals the vast store of knowledge and experience that makes up his professional side as the chief dispatcher for the sheriff's communications center. "I'm no different than any other dispatcher here," said Sgt. Garvey, a crew-cut, trim man with steely gray hair. "Everyone here has their share of busy days, memorable days and excitement." In the six years Sgt. Garvey has been with the sheriff's department - first as a jailer and part-time radio dispatcher at the old facilities in the county courthouse - he has seen his share of small and large fires, dramatic and easy-to-handle emergencies. By now, although he does not underestimate the responsibility or the difficulty, Sgt Garvey has learned to take even the most hectic days in easy stride. "A fellow once asked me how long it took to learn this job," said Sgt. Garvey, in that deep, composed voice that firefighters, police and reporters in the county know so well. "I said, "You never learn it all", no two calls are alike, and there's always something new. It's a challange to be able to serve the public, and that's what we're here for." Like other dispatchers, Garvey must be able to quickly and correctly handle a range of calls, from police to fire and ambulance alarms. He must get the right information from the caller, alert the proper unit, conduct the communications between members of the unit when necessary, and be available to assist firemen, police and rescue squad members immediately and effectively. "Too often it happens that someone will call us to say their house is on fire, they panic, and then hang up without telling us where they live," said Garvey, a native of Stockport and a resident of Stuyvesant Falls with his wife, Alice, a Stuyvesant native. "That's one of the biggest problems we face, but we usually can track them down with the help of the operator - particularly the Taconic Telephone Co. operators who are very cooperative - or by calling people who might know who they are. "One night we got a call like that, then we called around, finally getting the address of the house from an oil delivery man who knew where it was." That kind of fast action, the result of a thorough knowledge of the area and thier profession, is what makes the sheriff's dispatchers reliable in the tightest spots. That kind of ability and experience are skills that are not easily measured in terms of formal education, hours put into the job or in dollars and cents. But it is an essential capacity without which the busy communications center could not preform. "How can we educate the public to the fact that they should give enough information over the phone to the dispatcher?" asked Sgt. Garvey. "That I don't know, but it's important; in the six years that I've been on duty, I've only had people call me twice to ask what their fire district is, who the police are and what ambulance squad they should call in an emergency." 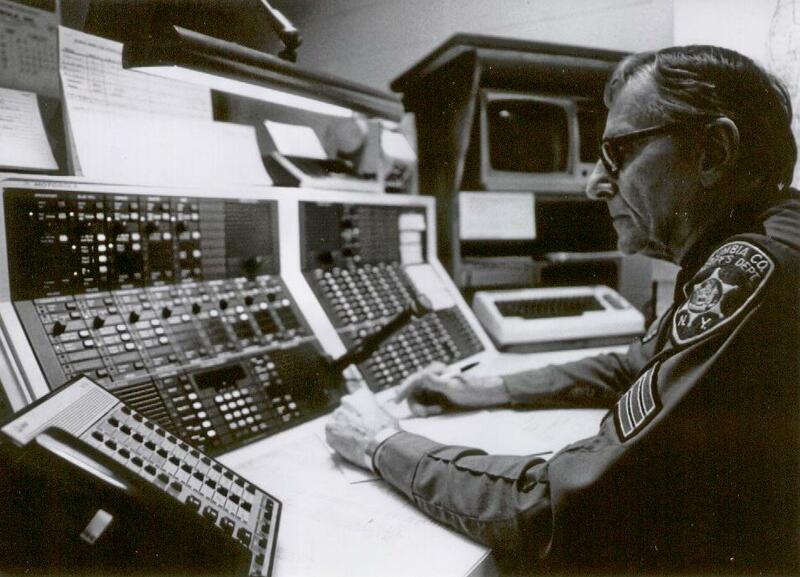 But, despite the difficulties inherent in the job, the dispatchers are remarkably good at getting the right job done. When a fire call comes in, the dispatcher takes the name, residence, as close as possible, and a telephone number. "People should realize that the dispatcher should be the first one to hang up the phone first," said Sgt. Garvey. "That way we can do the job best and can get the telephone number in case the firemen can't find the house." A volunteer firemen himself, Sgt. Garvey has the highest respect and sympathy for the volunteers he dispatches. To illustrate that opinion, Garvey said, in a reply to a question about a busy day he had in January when fires broke out all over Hudson, "It's not as tough at this end as it is at the other for the firemen; I really sympathize with them and especially for the ones in Hudson and in villages like Chatham, where they have to fight the fire in alleys and have to drag hose over fences and can't get the trucks in there if they're needed. It's tough for all of them." Besides dispatching police and ambulances, the staff of the communications center last year worked on 1,861 fire department calls - including fires, pumping details and wash-downs. Dispatchers also volunteer their time to meet with fire department members to take them on tours of the communications center and to explain to them the workings of the operation. "I can't stress enough how important it is for people to know what their fire districts are or at least to take the time to give us clear descriptions of how to find them," said Sgt. Garvey. "If somebody who lives on Schoolhouse Road doesn't tell us just where it is that's a problem, because there are six Schoolhouse Roads in the county."